GM's Suheb Haq, left, and Honda's Tomomi Kosaka. 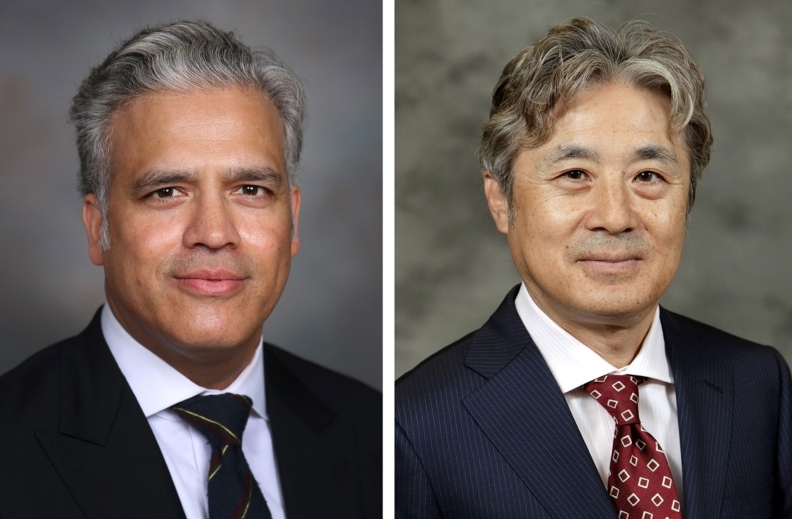 General Motors and Honda Motor Co. named the top management that will oversee their newly formed Fuel Cell System Manufacturing joint venture. Suheb Haq will serve as the joint venture’s first president. He was most recently director of GM Operational Excellence. Tomomi Kosaka will be the venture’s vice president. He was president and CEO of Honda of America Mfg. Inc.
Additionally, the automakers said the joint venture will include a six-person board of directors with three members from each company. Takashi Sekiguchi, managing officer and director/chief operating officer, automobile operations, Honda Motor Co.
Mitsugu Matsukawa, operating officer/COO, IT operations/head of production planning supervisory unit, production operations, Honda Motor Co.
Rick Schostek, executive vice president, Honda North America Inc. The automakers in January announced plans to invest $85 million to build hydrogen fuel cell stacks for next-generation green vehicles in Michigan. The joint venture will begin producing the fuel cell systems around 2020 at GM’s Brownstown Township, Mich., plant south of Detroit, where the automaker already produces battery packs for hybrid and electric vehicles. The 50-50 project will create 100 new jobs, the automakers said.